“Benny boy!” That was how Finis always greeted me – for a reason known only to him. You see, no one else has ever called me Benny, and I never figured out why he did. It really didn’t matter though, because every time we talked, he brought a smile to my face. He had this indescribably infectious energy and the uncanny ability to lift the spirits of those around him. Everyone that met Finis for any length of time knew that he was a very big man. Now, I’m not referring to his physical stature. No, I am referring to those things that really made Finis who he was – his big heart, his enthusiasm and zeal for life, his strong faith, and his unbounded love for his wife, family, and friends. He was the total package. Finis was one of “those guys.” You know, the kind of person that you can trust to always be there for you, no matter what. A guy that you might not talk to for a while, but the next time you do, it’s as if no time has passed at all. Someone that would run toward people in their time of need instead of running away from them. Basically, the kind of guy that everyone should strive to be. I try to surround myself with smart friends, and Finis was one of the very brightest. Whenever I encountered a tech issue that I couldn’t figure out, I’d reach out to Finis, usually in a time of great need and often at odd hours. He would always provide a solution that worked, without exception. In fact, if you look closely at the photo above, you can tell from the expression on my face that I was literally thinking “it’s just not fair that he is that much smarter than me”. Finis was a true genius, and I don’t throw that word around lightly. Even though he was much smarter than me, Finis and I shared many things in common. We both love technology in general (and Apple products in particular), and we gave numerous presentations about it all across the country. He and I co-hosted the MILOchat podcast, and Finis helped build MILO into what it is today. More importantly though, we discussed our hopes and dreams in life. I have laughed with Finis, and I have cried with Finis. Today, I cry for him, for Heather, and for all of us that will miss him so very much. As I mentioned, Finis was a man of great faith. He was a strong Christian, and I have no doubt that he is with his Heavenly Father today. Heaven’s gain is our loss, but it is a loss that hurts so very much right now. 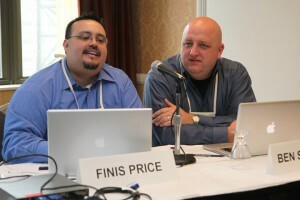 I have talked with many others today that love and respect Finis too, and we all collectively grieve his loss. I am proud to say that he called me his friend. Rest in peace, buddy, you will be missed. Because Finis and his wife, Heather, poured all their resources into their business, TechnoEsq, he left little in the way of savings. The Kentucky Justice Association has set up a restricted fund to accept donations, and all proceeds will go to his wife. If you would like to contribute, please send your contributions (be sure to note “Finis Price” in the memo line) to Kentucky Justice Association, 10602 Timberwood Cir # 8, Louisville, KY 40223-5367. Thanks.